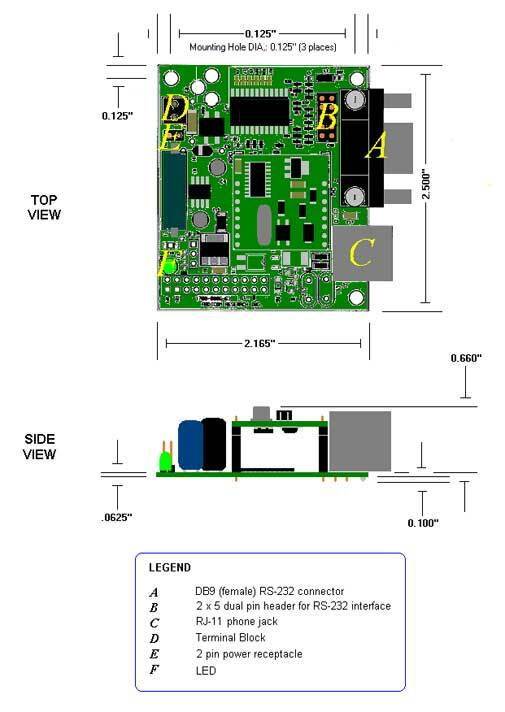 The RS232 Modem Module family features high-performance dial-up modems designed for integration into a serial device through a RS-232 DB9 connector. The modems will automatically accept DC power inputs ranging from 7V to 50VDC. Models are available in data speeds from 2400bps, 14.4K, 33.6K to 56Kbps(V.92). Features include fax, voice playback/record capabilities, automatic Error Correction and Data Compression for optimum data throughput and accuracy. The modems are also capable of detecting Caller ID information, DTMF tones, Distinctive Ring signals, Extension Pick-up, and Line in Use. Other enhancements include Digital Line Guard protection to protect the modem from damage if accidentally connected to a digital phone line.